You are currently browsing the The Pet Product Guru blog archives for the day Wednesday, January 30th, 2019. Which Personality is Your Cat? How Cold is Too Cold For Your Dog? Much of the nation is experiencing, dangerous, life threatening cold. In Minneapolis the temperature last night was -25 with a wind chill of -60! These temperatures are colder than in Antarctica. 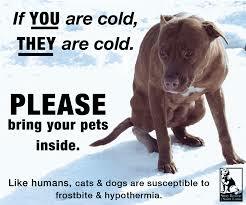 Your pet cannot take these temperatures and I wouldn’t recommend taking him out. The chart below outlines safe outdoor temperatures for pets. Pay close attention to your dog while outside. Protect his paws. It he starts shivering or whining, get him inside immediately! Walks should be kept very brief and do not scold him if he has an accident inside! The best oldies are in one place! Edgewater Gold Radio! Download the free Edgewater Gold Radio app. Ask alexa to ” play Edgewater Gold Radio! add comment Comments Off on How Cold is Too Cold For Your Dog? The Pet Product Guru social media advertising by iePlexus.com.